A 33-year-old man was shot to death during an early morning argument on Market Street in the Gaslamp Quarter. 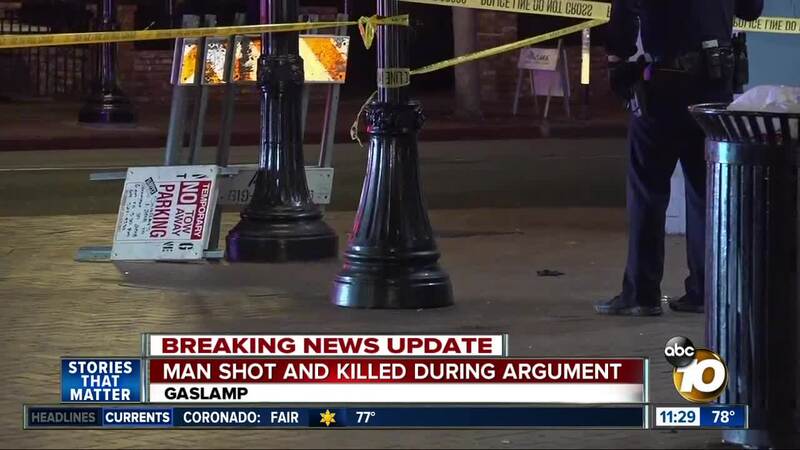 SAN DIEGO (KGTV) - Police arrested a suspect following an early-morning shooting in the Gaslamp Quarter that left one man dead. The shooting was reported at around 2 a.m. Monday on Market Street at 5th Avenue, according to San Diego police. According to several witnesses, the shooting erupted following an argument outside of a venue between two groups of people. Witnesses told 10News the victim swung a folding sign at a group of men when one person in the group opened fire. The 33-year-old victim suffered at least one gunshot wound, and police said he was pronounced dead at the scene. After the gunfire, witnesses said two men got into a cab and left the scene. However, police stopped the cab a short distance away and detained the men for questioning. Jonathan Hernandez, 23, was arrested after the shooting and booked into jail for murder. Market Street, between 4th and 5th avenues, was closed for several hours due to the investigation. The street was reopened at 8:25 a.m.